"Whales and other deep-diving marine mammals can pack 10-20 times more myoglobin into their cells than humans can, and that allows them to 'download' oxygen directly into their skeletal muscles and stay active even when they are holding their breath," said Olson, Rice's Ralph and Dorothy Looney Professor of Biochemistry and Cell Biology. "The reason whale meat is so dark is that it's filled with myoglobin that is capable of holding oxygen. But when the myoglobin is newly made, it does not yet contain heme. We found that the stability of heme-free myoglobin is the key factor that allows cells to produce high amounts of myoglobin." That's important to Olson because he wants to create a strain of bacteria that can generate massive quantities of another protein that's closely related to myoglobin. Olson has spent two decades studying hemoglobin, a larger, more complex oxygen-carrying protein in blood. Olson's goal is to create synthetic blood for use in transfusions. Hospitals and trauma specialists currently rely on donated whole blood, which is often in short supply and has a limited storage life. A crucial part of Olson's plan is maximizing the amount of hemoglobin that a bacterium can express. "Our results confirm that protein stability is the key," Olson said. "In this study, Premila and George developed an in vitro method for testing myoglobin expression outside of living cells. That allowed us to carefully control all the variables. We found that the amount of fully active myoglobin expressed was directly and strongly dependent on the stability of the protein before it bound the heme group." "The more stable the apoprotein, the more final product we could make," she said. "Human apomyoglobin isn't very stable at all compared to that of the diving mammals, which have versions of the apoglobin that are up to 60 times more stable than ours." Samuel said the stability differences aren't obvious if one simply compares the overall structures of the myoglobin from each species. Their overall shapes, including the shapes of their heme pockets, are the same. However, thanks to subtle differences in their amino acid sequences, the more stable myoglobins are better able to retain their shapes. Samuel said this underlying stability only becomes apparent when one studies the heme-free, or "apo" versions of the protein. She measured stability using chemicals that forced the apoproteins to unfold. By carefully measuring the amount of chemical required, she was able to precisely measure stability. She said her work was made possible by three earlier studies. In 1999, Emily Scott, a graduate student in Olson's lab, noticed that sperm whale apomyoglobin was much more resistant to chemically induced unfolding than the corresponding human or pig apoproteins. Scott wondered if the resistance to unfolding was a trait of deep-diving whales, so she gathered samples from a variety of mammals and confirmed the idea in 2000. At the same time, study co-author Smith, another of Olson's graduate students, was examining a catalog of 250 mutant sperm-whale apomyoglobins. 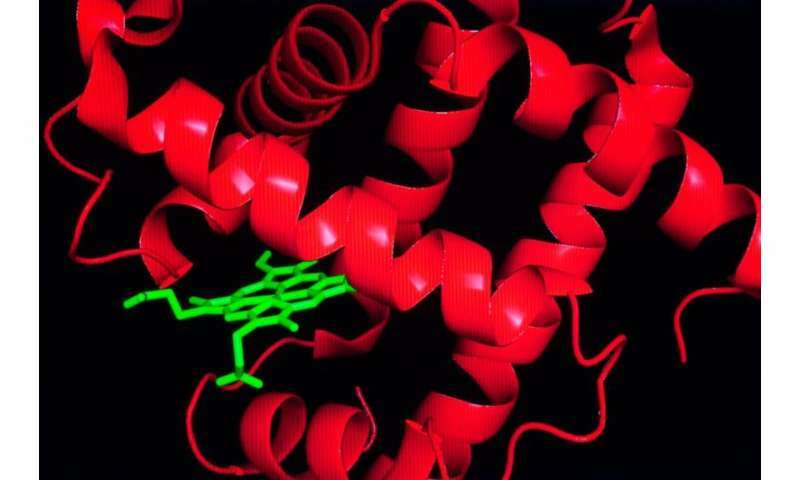 He noticed that a certain class of mutations in the heme pocket caused the proteins to become extraordinarily stable even though the mutations damaged their ability to bind heme and oxygen. "I heard Berenbrink present his work, and I wondered whether we should re-investigate Emily's and Lucian's work on expression levels and apoglobin stability," Olson said. "At the time, we were in the process of trying to screen large-scale libraries of hemoglobin mutants to try to select for higher stability and expression as part of our work on evaluating blood substitutes. George had suggested we use a wheat-germ-based cell-free translation system for those screens, and Premila was preparing to test the methods with myoglobin. "The three of us decided she should conduct her tests on a series of proteins that included myoglobins from humans, pigs and several of the deep-diving mammals that Emily had tested and Berenbrink had examined," Olson said. "We also used Lucian's Ph.D. results to construct three mutants that were far more stable than anything found in nature." "This work is very important for our projects on synthetic blood substitutes and determining the toxicity of acellular hemoglobin," he said. "Premila has laid the groundwork for high-throughput screening of large libraries of hemoglobin variants without the need for purifying milligram quantities of pure protein. This method is a big step forward in our efforts to identify more stable recombinant hemoglobins." No animal can eat us up for a snack. Give a BIG shock inside its buccal cavity, if it is a whale AND GET OUT SAFELY! 'Myoglobin' the ultimate athletic performance enhancer. I wonder if swimmers, pearl divers, and marathon runners naturally have more or a better version? Or if (anaerobic) physical training causes cells to contain more of it.